Heather grew up in Hickory, NC, surrounded by pets. As the daughter of a veterinarian, she enjoyed a childhood with dogs, cats, hamsters, fish, horses, geese and goats. She is a graduate of UNC-Chapel Hill with a Bachelor of Arts in Psychology and graduate of UNC-Greensboro with an Masters of Science in Exercise Science. 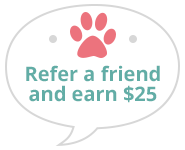 Her first career was as an exercise physiologist , but her overwhelming love of animals and innate creativity led her to her current career as a pet stylist. She attended Nanhall School of Grooming where she learned AKC breed standard grooming and pet style grooming as well as how to groom cats. 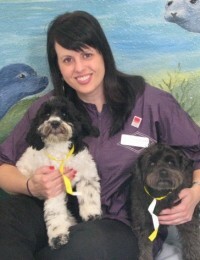 She loves caring for dogs and cats and creating a positive, calm and safe grooming environment. Her favorite aspect of grooming is taking the the unique characteristics of each pet and bringing out his/her best attributes. Heather lives in Durham with her fur kids. She spends her spare time doing home improvement projects, gardening/landscaping her home, hiking with her dogs and practicing yoga.